If you live in NYC, what are you doing tonight? 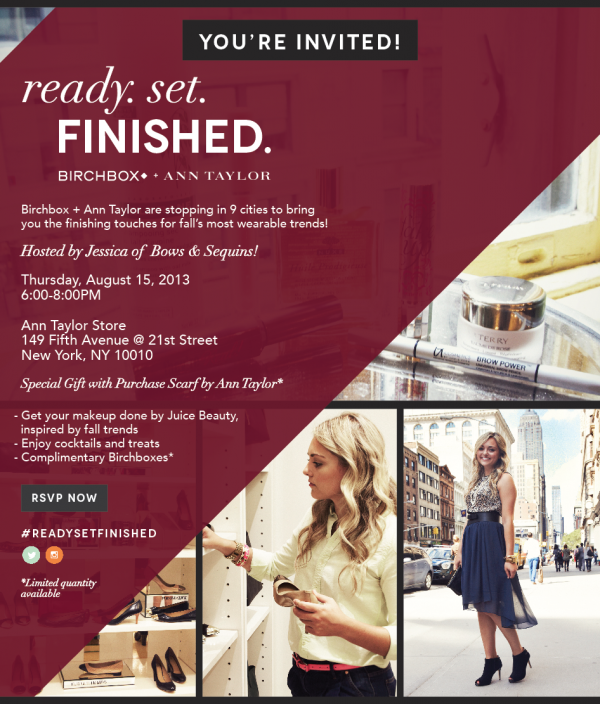 You can find me at the Ann Taylor + Birchbox event at the Ann Taylor Store on 21st Street for a fun night of makeup, cocktails, and some free goodies! I am so excited about this event because one of my favorite bloggers, Jessica of Bows & Sequins, will be hosting. Hopefully I will see you there! Haha,great minds think alike! My friend Jessica and Julie (who I was with this past weekend) will be attending the NYC one too. Maybe you will run into each other :) Would much rather be joining you than the one in Chi-town! Hey Lindsey! I just wanted to let you know that I have nominated you for the Liebster Award :) You can check out all the details at my blog!